If users can’t trust the platform, then how valuable is the ad space? As the Super Bowl approaches, the National Football League’s PR teams do significant, and useful, outreach to help make fans aware of the consequences of unlicensed merchandise. 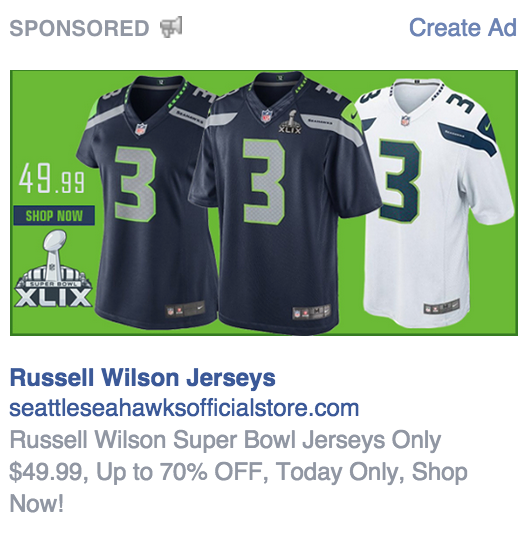 Oftentimes, purchases of these fake jerseys, hats, and other gear finance criminal enterprise. You may think of counterfeit merchandise as something that’s sold on a card table by a sketchy guy downtown. You know, the guy who quickly folds up the card table and runs if the police walk up. However, these sketchy groups have taken their card tables online, and alarmingly, Facebook seems to be profiting off of this trade. 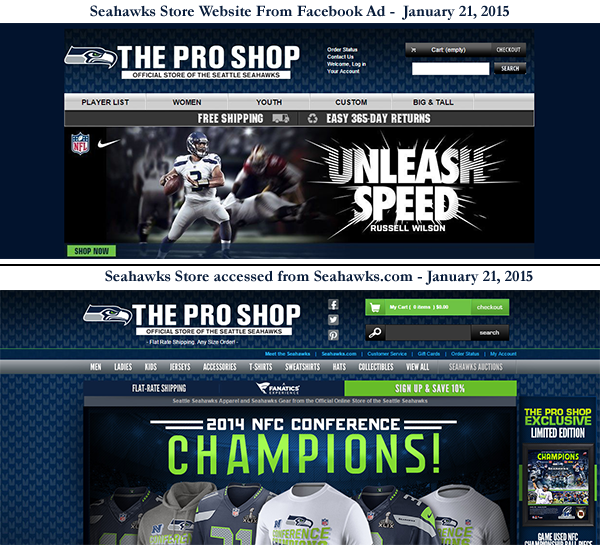 Upon visiting this store’s website, you see a store that legitimately looks like the Seahawks team store. The masthead’s the same, the verbiage describing the products are the same, but when looking at the finer points of page design, only then can you see a difference, and it’s slight. The Seahawks’ “feathering” pattern goes all the way across on the real site. Of course, this isn’t the first online scam, and is by no means the last. However, what concerns me about this is how users arrive at this fake site, a false store that’s just waiting for your credit card number. Facebook serves many, many, legitimate ads to users and paid ads on their platform are seen as valuable tools for legitimate brands big and small. However, as a platform, Facebook appears to be doing little to protect its users from this malvertising. Worse yet, they appear to be profiting from it. While the NFL raises awareness for merchandise scams, it would behoove them to take their fight against fake merchandise online and take Facebook to task for exposing their fans to these scams. For marketers of all products, it raises an important ethical question: What is the value of paying for an ad that appears on an untrustworthy platform? Would you want your company’s ad appearing next to entities pretending to be something they aren’t? This entry was posted in Trustworthy Computing and tagged Counterfeit, Customer Protection, Digital Marketing, Facebook, Merchandising, Online Safety, Online Scams. Bookmark the permalink.